These images show a PD site in a medium voltage power cable, part of a collector system designed and installed at a wind farm in Idaho during 2005. In the first few years of operation, the site experienced a very high collector system failure rate. The site managers first conducted DC HiPot withstand testing to determine the quality of the cable system. Unfortunately, the testing produced unsatisfactory results: multiple failures continued to occur even after undergoing the test. IMCORP was contracted to detect and locate the reliability issues in the collector system using its Factory Grade® technology. One of the first cables IMCORP analyzed is shown above. Here, IMCORP was able to locate a defect 3551 feet from the near end termination. In this particular case, the cable installation trench was improperly refilled with soil containing large rocks instead of the recommended engineered back-fill. A rock tore through the cable's jacket forcing conductive material into the semi-con. 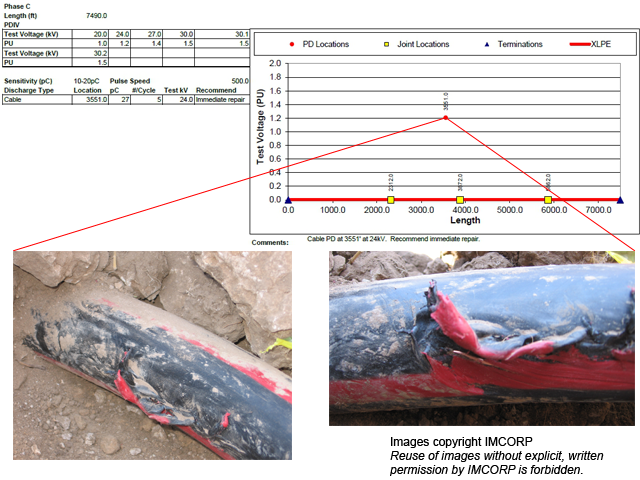 After IMCORP found this PD site and many others like it across the collector system, the site owners were able to effectively fix the problems before they resulted in additional cable failures.